Beane is leaving nothing to chance. Great signing! The Process continues. I agree. I am NOT a fan of taking a TE until 3rd or 4th Round based on how long they develop and how history has demonstrated their contributions. If you're anyone in the 1st round, they need to be a first year significant contributor in some measurable capacity. Only one TE in the last 20 years has shown to be worth the 1st round status: Tony Gonzalez. Gronk was a 2nd rounder and he's shown he's worth it, but that's where it stops for me. I'd rather take a OT / DL in top 10 this year or trade back for a LB and pick up an extra 2nd or 3rd round pick. I also one who thinks while the Bills did really well in FA with Offense, they have real holes on Defense and need good depth, which is where the strengths lie in this Draft, again IMO. To that end, I'd like the majority of the 1st through 4th round picks to be on Defense with a WR / RB thrown in the mix. That's funny. And no Bills stuff simply because as much as I love the Bills, for a number of years I moved around a lot and didn't collect things. I've never been collector of anything. In fact I probably throw more stuff away than I should. That said, I used it every night and on game days, but I also made it kid friendly for my daughter who was younger than 5 at the time. So, while she wasn't in it often, I wasn't going to keep her out of it either. Suffice to say, it was a man cave because it was mine to use and because I made it that way, but not because of décor or because it had a bunch of other male-oriented items in it. My next man cave will be similar, but a little more for me now that my daughter is a few years older and doesn't need extra play space. This was mine as part of the mostly finished basement until about two years ago. My family and I moved to Europe and then we moved back, so in the process (about halfway there) to getting into a new house. What you don't see is a 55" flat screen hanging on the wall opposite the couch and yes the bar had mini-fridge stocked with beer and soda along with snacks on the shelves under the bar. It was quite nice. I miss it....but, I'll get another one next Spring. First, there needs to be a qualification of which WRs were "disgusting". For example, Foster was a part of PFF's Elite ranking and Zay Jones' second half of the year when Josh started to put it together was respectable. Zay Jones' Numbers in the second half of the season: Rec: 31 (of 56 total) Yards: 371 (of 652 total or 57%) TDs: 6 (of 7 total) Now, none of these numbers are incredible or great, but he came on when Josh Allen did (big surprise) and those second half numbers include a Jax game where he was targeted 1 time with 0 receptions. And that was a game-plan vs. Defense thing for the most part so putting those numbers in context shows improvement while Josh was improving. That means, it wasn't just "him" as a WR it was the whole Offense. Meaning, before you lump Foster and Z. Jones in with Kelvin-I'd rather be eating - Benjamin and the others who were NOT good, there should be some examination of information and what most of us saw with our eyes even without stats: the second half of the year showed a much different Offense as a whole and a significantly improved Josh Allen especially in the final 4 games. This should be encouraging to you and I hope it is...furthermore, when you add in Brown and Beasely and who knows what they get in the Duke kid from the CFL, putting a 1st round stake in a WR to me, is unwise. WRs in today's NFL do not carry the value above replacement level worthy of a 1st round pick. Segue into the second point about "what you can get in the 3rd or 4th round of this draft", you might want to re-think that. From Antonio Brown being a 6th round pick to Doug Baldwin being a 5th round pick, to our very own UDFA Robert Foster, a 1st round WR does not a star make. In fact, I could (and would) argue that investing in the Offensive line the way the Bills have thus far, and maybe Drafting a RT of the future would do more for the passing game than adding any WR prior to the 3rd round. I know we're probably going to disagree, so I won't belabor the point but I felt like this was all worth saying. Go Bills! The only issue I see with that scenario is almost entirely Offense in the first 3 rounds and the teeth of this Draft in the early rounds is Defense. So, in your example if 15 were a LB or DT, and the other 3rd is the one not selected in the 1st I’m good with that. Because LB / DT is a sneaky need for the Bills, IMO. And a good WR can be had in the 4th; Offenses no longer rely on a traditional #1 WR and given the Bills’ WR additions, I don’t see the Draft being a priority for them in that area. Last year I was not overhyped on Rosen. I trusted the process and so far, I'm encouraged by what has transpired since the Draft last year. That said, if I'm the Cards and I truly believe Murray can lead you to a championship, then trading Rosen for something of value makes the most sense. However, given the significant position issue of QB, I could also be talked into letting those two show in Camp and Pre-Season who deserves the tab to be the starting QB. If I was looking for a destination, all the usual teams would jump out: Jags, Giants, Pats. However a couple sneaky teams I could see? Saints, Seahawks and Denver Saints: let Teddy and Rosen show whom is the best QB Seahawks: with all the Russell Wilson chatter, let's see who's left standing Denver: Well, you know....Elway and QBs. Somewhere up thread someone said that Edmunds wasn't great and his lack of production was overshadowed by the piss-poor Offense. I disagree. Edmunds showed real Rookie issues in the first half of the season. But just as fairly, he also showed tremendous improvement in his second half of the season. Let's take a look at his stats: First 8 games: Tackles: 62 - Sacks: 1 - Pass Defended: 7 - Forced Fumbles: 2 - INTs: 0 Last 7 games: Tackles: 59 - Sacks: 1 - Pass Defended: 5 - Forced Fumbles: 0 - INTs: 2 (Didn't play against Chicago) To take that a step further in his last 4 games, he really started to jump off the screen with development: Tackles: 39 - Sacks: 1 - Pass Defended: 3 Forced Fumbles: (Still 0 obviously) - INTs: 2 Looking at his production that way, he started out a little hot, then cooled, then slowly went up for a few games and then shot up at the end of the year, where you want your 1st and 2nd year guys to show the best improvement. Does he need to grow / mature into a better LB? Yes, of course he does. Was he so bad that I think he needs to make a Herculean leap to be great? No, IMO he does not. To that end, IF and it's a big IF, he continues to develop at the year's end trajectory, his second year should be quite good and probably his second half of this year we'll see what Beane and McD saw when they drafted him: a STUD LB that can anchor the Defense for years to come. I agree that at this point the Bills need quality over quantity. That said, I don't think that necessarily means the 1st round. I think the Bills *could stay put and trade back into the 2nd round via a 3rd and 4th. AND trade back into the 3rd via a 4th and 5th. Meaning: 1st, 2nd, 2nd, 3rd, 5th, etc. Now, I could also think that while the Bills don't NEED quantity and DO need quality, they could just as easily trade back and pick up an extra 2nd, making that same argument that you move down but pick up an extra 2nd, without giving up your 3rd and thereby staying at the top of the 3rd round, then positioning a 4th and 5th to get back into bottom of round 3. IMHO, that's the better move that gives you real quality at a couple positions. Meaning: trade back 1st, 2nd, 2nd, 3rd, 3rd, 4th, 5th, etc. Additionally, I think we've all seen just how big injuries impact a good team's year and having depth at key positions helps insulate against that very issue. So, CB / WR / DT / DE and LB, all come to mind regarding the Draft. Then there's the elusive RB issue. They MUST get younger legs and picking up an extra 3rd, allows them to get a very good RB without giving up that depth. Just my 2 cents because 1st round does not guarantee you top tier playmaker - just the opportunity. The league is rife with tremendous players Drafted in the middle rounds and honestly - that's where real championships are built. I definitely sound like a broken record, but let's keep in mind Beane and McD have found Draft gold all over the place from the early rounds - as they're supposed to - to Milano in the 5th, Taron Johnson in the 4th, to Wallace and Foster as UDFAs - who were listed among PFF's elite. Teller was a 5th - jury is still out but he seemed to make some developmental strides last year. So, while I won't second guess anything Beane and his team do on Draft weekend, I don't know that giving away all picks from the 4th after mean you're necessarily getting a better player either. All of that said, I can finally say after so many miserable years, the Bills have a plan and at least thus far, seem to know what in the hell they're doing....that....is refreshing. I think we should all remember the Bills have historically undervalued Offensive Line since the Kelly-Levy era ended. To me, this is exactly what we've all wanted. A GM and HC invested in the second most important position group in the sport: Offensive Line to protect and aid THE most important position in the sport: QB. We don't get to complain for going on 20 years about how bad the Bills have handled the Offensive Line, only to see them take their QB the first year and then go heavy Offensive Line the next year and keep a straight face or any credibility for that matter. Now, does that mean I think they should go all in on that position group in the first two rounds? No. But, that said. If they're going to err on the side of caution and target Offensive Line in the 2nd and 3rd, I completely understand that as well considering all their fortunes are tied to Josh Allen. No QB can throw behind a terrible line - so making darn sure they have the talent and monsters on the line to do just that - protect their future and generate a Running game - is fine by me. 1st round is probably Defense. But if they trade back, it could be a WR. However, given WR position value, I would prefer the Bills keep their picks where they are. Top 10 talent somewhere, 2nd & 3rd for guys who contribute early but aren't necessarily super stars, and then the rest are value picks. That said, Milano a 5th, Wallace and Foster UDFAs - so great players can come from anywhere. I really like this Off-season - and not because of big name splashes, but because there are value adds all over the page of this FA season which means it is strictly BPA for the Bills WITH a QB!!! 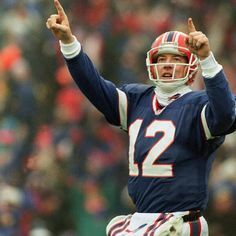 This is the first time since Kelly that I can relax during this time of year and not have to think the Bills need to win the lotto to get good players. The only thing I wish with this signing, was that it was for longer. That said, I also understand the Bills' perspective and his: both want a trial period to see how it goes and if it works out well, I think they both know they'll be paying a higher premium. In a storied history of terrible takes on this board....*this* one, must be near the top 5. This Draft is rife with DE / EDGE and DT talent and to trade for a player, unless the ask is minimal, does NOT make sense when the Draft is stacked in favor of a position of need. IMHO, you trade for a player when you can't get the level of player you want in FA or the Draft, like maybe LB for this Draft but you don't give away picks in a year when you'll have so many good to great ones to choose from that are younger, more team friendly contracts, and still have their premium years ahead of them. The exception would be a QB, but all other positions IMO, should start with this philosophy.